In Pittwater the estuary’s pristine beaches would have been popular spots for swimmers, long before the area was promoted as a ‘resort’ which included ‘surf bathing’ as well. 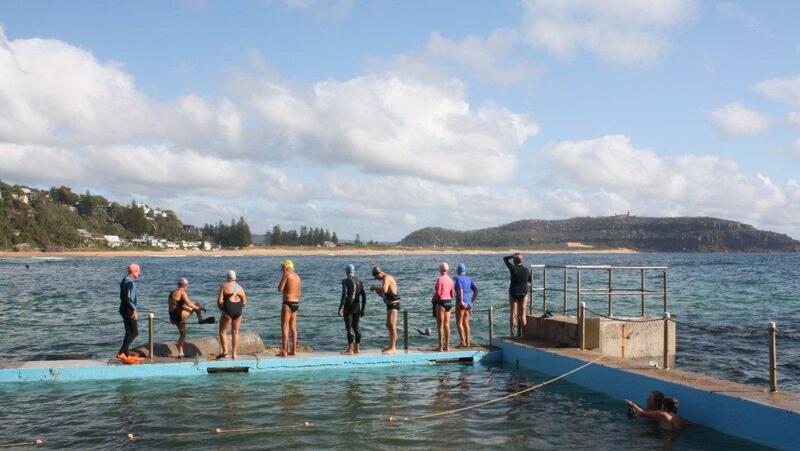 Estuary pools were the first marked off or gated to make them secure from the many sharks that once frequented the Pittwater. These were both public ones like that at Bayview, or private versions, fenced off in front of homes with jetties. Those on the coast, once called baths, now swimming pools, were in many cases where a natural rock pool had already formed and been used prior to a more ‘concrete’ construction. As snow winds bring a touch of extra invigoration to early Winter mornings, some will head indoors to get their laps done in heated pools despite the residue summer warmth in ocean currents. 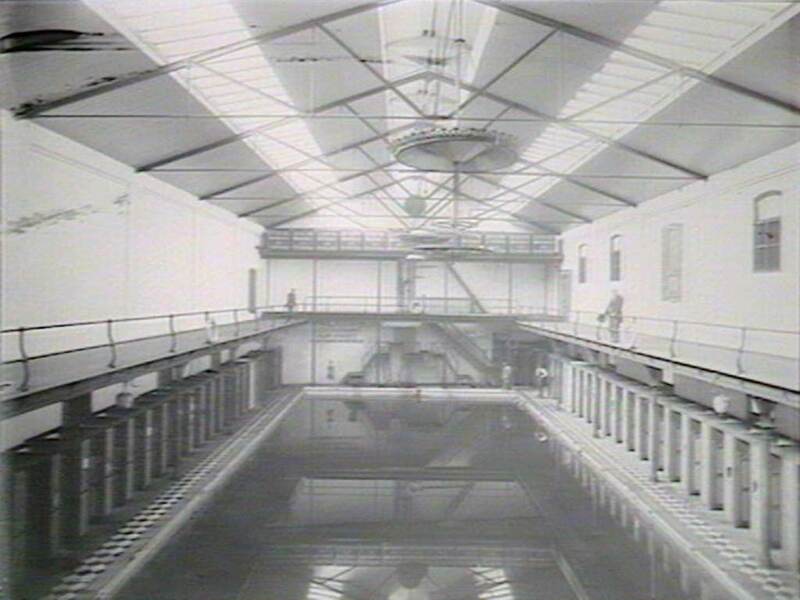 Which was the first large scale indoor pool in Sydney though – and how warm was it? If you decide a Turkish Bath is pool enough, then the first was John Le Gay Brereton’s 120-150 degrees Fahrenheit 1859 edifice in Captain Cook's Hotel in Spring Street, Sydney. If you require a bit more splashing about, some laps, some racing, perhaps even room for a spot of water polo, then the Natatorium, once a feature in Pitt Street towards the Haymarket end, of Brickfield Hill as it was more commonly called then, was where you went to have your splash of healthful bathing. This pool was fed by saltwater from the harbour and a claim that the water was kept at 95 degrees year round, or ‘Summer Temperatures’. It took a few years for the Natatorium to be finally opened and then, soon after its first decade elapsed, became the People’s Palace, run by the Salvation Army, who seemed to have leased the premises at first and paid for them in 1904. An article from November 6th, 1896, speaking of all suburbs should have free safe bathing facilities, particularly those far from the coast during hot weather, coupled with the fact that you had to pay and only had a limited time in the Pitt street Natatorium, may have made it an non-viable venture. Swimming clubs were everywhere during the 1880's in Sydney and people competed for good prizes or simply for prestige in amateur leagues. Another item points to the real problem - the hotel in which the pool was housed was unprofitable, and, although the pool was run as a separate venture, the profits from it were poured into keeping the hotel afloat. The building at 400 Pitt street was subsequently sold again by them during the late 1980s and demolished in 1988 (398-408 Pitt Street), lasting only a mere century, although some semblance of the original facade was kept. Interestingly, a new hotel is being proposed for next door this year – some indication of how people who strolled these hills and open vistas to Darling Harbour may have trouble recognising ‘Brickfield Hill’ as this part of own was known then, or any of the structures that now try to accommodate even more people an visitors into this vibrant end of Pittwater Street. SALT WATER BATHS FOR SYDNEY. One silver trowel, diamond shaped flat blade has fan decoration around rim. The base has an engraved butterfly amongst flowers. The inscription is inside an opened fan. Octofoil haft rises to a mother-of-pearl handle. Silver hallmarks of T.M &Co, Queen Victoria, Birmingham Silver .925, 1885. 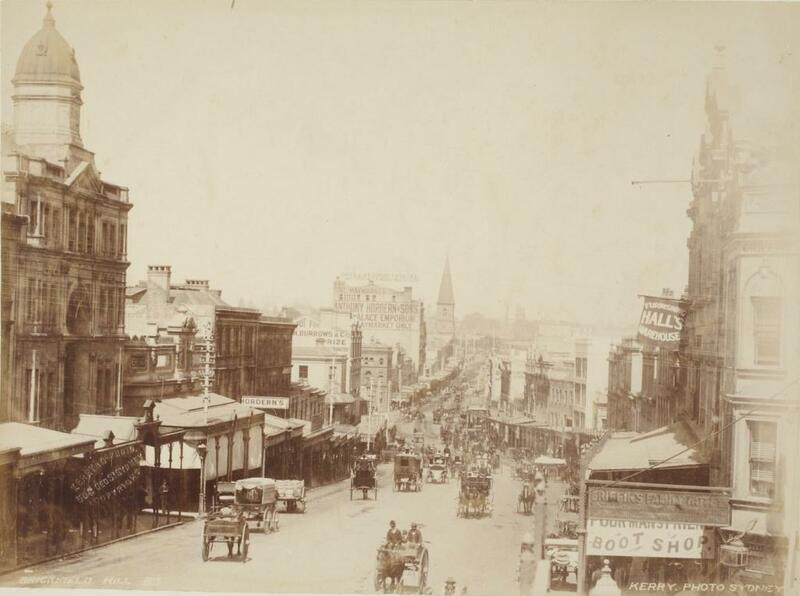 After some little delay operations in connection with the construction of tho baths which are to be built by the Sydney Bathing Company have been duly commenced, and in a comparatively short time Sydney will be provided with a very complete bathing establishment. The building is to be erected on a vacant piece of ground in Pitt-street, between Campbell and Goulburn streets, and will hate a frontage of 134 feet to the first mentioned thoroughfare. Very elaborate plans have been prepared, and if the design is faithfully executed the building will, besides supplying a want which has been felt to exist for a number of years, be a very creditable addition to the many noble structures which have been erected in the city at recent dates The work of excavating has been going on for the past few weeks, and already over 6000 cubic yards of clay have been removed, and two large swimming basins, each 100 feet by 40 feet, have been formed. The basin stalls, which are now in course of erection, will be constructed of substantial concrete. They will be double walls, and will be built in a manner which will prevent the percolation of water. Some progress has been made with the side walls of the main building. These will be built of brick and will be roofed with iron and glass. Particular attention will be paid to the matter of ventilation, and system will be introduced whereby currents of air will enter the building from all sides, so as to curry off the evaporation of the large area of water and make the place cool during the hot summer weather. Neatly-constructed dressing cabins will be provided along the sides of the basins, and they will be numbered for the convenience of occupants. A space will be allowed for promenading. At different places along the basins there will be spring boards and stone steps for entering the water at any desired depth from 3 feet 6 inches to 10 feet. A spacious gallery will be constructed around the basins, resting on iron columns, and suitable spandrills. In the galleries seating accommodation will be provided for from five to six hundred spectators, who will be able to view swimming matches or aquatic performances with a considerable amount of ease and comfort. Several new and interesting features will be introduced by that architect. It is proposed to illuminate the water in the basins with the electric light from the door of the basins, so as to display the movements of performers during evening entertainment. Another pleasing contrivance will be one by which provision will be made for the playing of several powerful waterspouts, which will rise to a height of from 20 to 30 feet, to give motion to the water, and cooling showers to those swimming on the artifical waves. The water for the baths will be salt water, which will be obtained from the harbour near Mrs Macquarie's chair. The water will be pumped through the corporation pipes. The pressure will be obtained by bringing it by way of Darlinghurst, and before entering the basin it will pass through sand and filters. The main building of the baths, which will have a frontage to Pitt-street, will be six stories in height. This portion of the premises will be converted into offices and shops, restaurants, boarding-houses, or billiard or reading-rooms, as may be required. One of the most valuable additions to our city institutions for the comfort and convenience of citizens is the 'Natatorium,' situated in Pitt street, near Goulburn-street. The structure is owned by the Sydney Bathing Company, and some idea of its popularity may be gained from the fact that last summer over 80,000 persons patronised the baths. The company have erected a splendid building, intended for an hotel, which contains no less than 85 rooms (exclusive of the bars), ranging from 40ft x 22ft, and bedrooms from 12 % 15 to 16 x 17.The entrance to this structure is by a capacious and veil-ventilated lobby, which can be utilized as a comfortable lounge room or convenient retreat in warm weather. A large bar will open, off this, and the other aiding apartments, including an extensive billiard and dining room, parlors, and dormitories, will all be upstairs, and reached either by a lift or two winding staircases; while the base of the building consists of -large vaults with asphalt floors, having communication by aright-of-way to the main street. Gas and water and fire escapes are provided in addition to the ordinary balcony traversing the front of the building, there is a splendid promenade roof extending its entire length and breadth, and from which an excellent view of the city and suburbs is obtained. On one side of the hotel are four large shops, and on the other side is the manager's office and ticket room. The admission to the second-class is 6d, entitling the bather to clothing and to remain from an hour to an hour and a half. The measurement of this bath is 100ft x 40ft, giving a clear swimming distance right round of 280ft. The depth of water is from 3ft 6in to 8ft 6in; the bottom being concrete and asphalt. There are dressing boxes at the sides, on the landing or top floor of the basin, and others on the balcony surrounding the bath, on which are a number of chairs for the convenience of bathers, or the accommodation of their friends; also lavatories, and shower baths. Short rope ladders are attached to the sides of the bath, with hand ropes to assist the bather in leaving the water when and as often as he or she may desire. Adjoining is another apartment where hot baths either of fresh or saltwater can be secured at anytime, the heat being generated by steam which is conducted by inlet pipes from the 25 horsepower boiler. The swimming basin contains about 160,000 gallons salt water which is always kept at a temperature of 75 degrees Fahrenheit, being the usual natural summer temperature of water. Life buoys are also hung at convenient places, and the attendants are all ex men-of-wars men of the Nelson, who seem in their native element when in the water; and are ever ready, and always at hand, in case of emergency. The first-class basin or swimming bath is entirely distinct from the second, and entered by another way altogether, and is much more elaborately fitted up, and well worth the extra 6d charged for admission. Here there are fifty-eight bathing boxes, the front of each of which contains a panel mirror. At a distance of about 5ft from the water's surface are two trapezes, consisting of a very large double and single one, fastened to the beams, and on which the skilled can manipulate, or the uninitiated wishing a good sousing desport themselves without fear of, in the event of falling', sustaining any material injury. There are also three excellent spring boards, together with another fixture known as the ' The American Slide' placed in a horizontal position, over which water is continually flowing to keep it greasy. Any person not wishing to take a ' header' can use the slide, and when once thereon, into the water he or she must go. Bathing suits are obtainable at the baths on application. The first-class basin is the one set apart for ladies, owing to its greater seclusion and privacy, and they are provided with an expert female attendant. Lifebuoys are also provided in this bath, and also experienced swimmers within easy call, and ready to render immediate help if necessary — a contingency which happily has not in the past arisen, nor is there any great probability of its so happening in the future. Attached to this first-class basin is a smoking and sitting room for the convenience of gentlemen, plainly but neatly furnished, in fact, everything likely to contribute to the comfort of the visitor seems to have been carefully studied by the proprietary. This basin also has 160,000 gallons water, and is, with the second-class basin, cleaned out once a week, the water being -run off through five large 12in mains fitted in the bottom and delivering into the main sewer. Fresh salt water at the conclusion of the cleaning process, is then, by the aid of the City Corporation engine, pumped in from the sea at a point opposite Garden Island, and the water conveyed some three miles through iron pipes to the baths. In the summer 50,000 gallons are daily ' run off, and a fresh supply pumped in. There is an excellent drying place, at which it is said 800 towels can be dried at one time. These are washed by steam. The greatest number of persons in the basin on any one given time was 250, and then all could conveniently swim. There is an excellent code of roles prohibiting swearing, smoking (except in the first class smoking room), and diving from off the balconies, &c. Mr. Arthur A. Barry is the manager, and is evidently the right man in the right place, everything being scrupulously clean. A placard notifies that the proprietary will not be responsible for the loss of any valuables, which may, however, be left for safe keeping with the ticket clerk, who supplies the owner with a brass token, having a number thereon impressed, corresponding with the number of the pigeon hole in which his valuables are deposited; but before regaining same he is expected, when presenting his token, to give a description of the articles left, thus guarding against the probability of his being robbed while inside and the false owner dishonestly acquiring his property. Space does not allow of a more extended notice; but suffice it to say, we regard these swimming baths as one of the institutions of Sydney. The Natatorium, so long the convincing spot of New South Wales— Australian, in fact— swimming championships and club rivalries, was closed on Wednesday last, for how long it is hard to say just now; but if those who will have to bear the burden of this regrettable fact possess no more than a modicum of business acumen, the period during which, the wind will be allowed to whistle through the spacious swimming basins and surrounding roomy galleries, where enthusiastic onlookers were wont to give vent, In rapturous applause, to their appreciation of the hard-fought contests and remarkable feats taking place in the placid water beneath, will be very brief indeed. I can remember that for some considerable time after their establishment the baths returned n revenue of fully £50 per deim and bade fair in these days to secure an octopus like grip upon all the bathing business in and around the city, owing principally to their contiguity to the different centres of trade. The elaborate dressing-rooms and conveniences of all descriptions, as well as the general ornamentation of the first-class basin, is including a large number of handsome mirrors at intervals of a few feet all round the swimming space, were the theme of much admiration. 'Mr. Barry was the courteous, able, and hard- working manager at that time. But, alas, for some reason or other, shortly after the gentleman named left matters began to assume a neglected state, and went from bad to worse. The action of the steam from the tepid water in the winter, had a deteriorating effect upon the mirrors, and ornamental portions of the surroundings, and there appeared to be an absence of care generally. Rumors were rife(whether true or otherwise I do not pretend to say) to the effect that the basins were not cleansed or emptied for many weeks at a stretch. Then again the presence of fresh water, mixed with the salt, was very often easily detected by men who were habitual bathers in the briny. The natural consequence of those circumstances was a considerable falling off in public patronage, and even then the baths produced a satisfactory profit, but the hotel, as a good many predicted, although well conducted, did not prove the success anticipated, and absorbed all that was gained from the baths. It required no extraordinary prophetic power to foretell the ultimate result of such a state of affairs. 'Sixty-four members already,' was the statement made by the Hon. sec. of the Police Swimming Club at a meeting held in the Natatorium Hotel last Monday night. Sergeant Parkinson occupied tho chair, and was surrounded by a large numbor of sergeants, senior-sergeants, and senior-constables, as well as several of the rank and file, and all were very enthusiastic over tho now venture. AMATEUR SWIMMING ASSOCIATION'S CARNIVAL AT THE NATATORIUM. 1. View in the Natatorium. 2. Finish of the 220 Yards' Amateur Championship. VIEW OF DOCK. START FOR THE LADIES' BRACELET, 75 YARDS. FINISH OF THE SECOND HEAT FOE THE LADIES' BRACELET. BALMAIN SWIMMING CLUB CARNIVAL AT THE SUTHERLAND DOCK. The Balmain Swimming Club held a very successful carnival on Saturday in the Sutherland Dock, Cockatoo Island, which had been lent for the occasion by the Minister for Public Works. There were about 2500 spectators present. The principal event of the afternoon was toe half-mile championship of Australasia, which was won by P. Cavili, of the East Sydney Swimming Club, the time being 13minutes 27 seconds. Some disappointment was expressed at H. Heath (Victoria) and H. J. Bailey (N.Z.) not starting, but it is understood that both were unwell. Owing to the lengthy character of the programme the competition for the water polo championship of Australasia was not played. The officials were— Referee, Alderman A. M. Milne(Mayor of Balmain) ; judges, Messrs. Alfred Hunt and W. Cornish ; starter, Mr. Arthur W. Griffith ;check -starter, Mr. Thos. L. Wilkinson ; timekeepers, Messrs. A. Harrison (N.Z. ), W. T. Kerr, and A. W.Griffiths ; lap takers, Messrs. Alf. Hughes and F. Whitehouse ; costume stewards, Messrs. H. Burns, S. Collyer, and D. Lindsay ; result stewards, Messrs A. Vandyke and J. M'Bride ; clerk of toe course, Mr. E. Knight. The results were as follow School -Boys' Handicap, 75 yards.— The following won their heats :-J. Bishop, 9 seconds; B. Hamilton, 12seconds ; and C. Davis, 11 seconds. Final : C. Davis, 11seconds, 1 ; B. Hamilton, 12 seconds, 2 ; A. Grant, 2 seconds, 3. This was a very close finish, Davis just winning by a bare touch. Seventy-five Yards Ladies' Bracelet Nomination Handicap. — First heat : H. Waites, 15 seconds, 1 ; W. Bishop, 6seconds, 2 ; J. H. Lavre, 9 seconds, 3. Second heat : B.Foley, 6 seconds, 1 ; E. Howes, 13 seconds, 2. Third heat :D. Proudfoot, 7 seconds, 1-;* J. Hancox, 7 seconds, 2 ;H. B. Musgrove, 7 seconds, 3. Fourth heat : F. Austen, 7 seconds, 1 ; G. Caldwell IS seconds, 2 ;W. M. Carroll, 11 seconds, 3. Fifth heat : W. Irving,6 seconds, 1 ; Sid Davis, 2 seconds, 2. Sixth heat :J. Davidson, 6 seconds, 1 ; W. Coulsen, 3 seconds, 2.Seventh heat: A. WiUdns, 11 seconds, 1; V. Lindberg, 6seconds, 2; D. Gilles, 6 seconds, 8. Final: A. Wilkins, 11seconds, 1 ; XL Waites, 15 seconds, 2 ; D. Proudfoot, 7seconds, 3. This was a splendid finish, all the competitors being bunched together. There began on January 19 a new epoch in the history of 'the Sydney (Salvation Army. The late Natatorium buildings in Pitt-street, having been secured by Commandant Booth and altered, furnished and renovated at a cost of £2300, were in the afternoon informally re-opened - under the name of the People's Palace, for the better carrying out of the army's great scheme of social reform. The undertaking the commandant regards as quite the biggest yet attempted by the Salvation Army in any part of the world, the great shelters in London, Paris, and New York not withstanding. A large number of friends accepted Commandant Booth's invitation to visit the premises and inspect its vast resources, among them being Messrs. Hawthorne and Jessep, M.L.A., Dr. Vandeleur Kelly, and Mr. M'Lachlan. _ After a hymn or two and an earnest prayer by Major Graham, the commandant explained the nature of the new undertaking, which he characterised as being as important to the city of Sydney as to the Salvation Army. All classes of people would find accommodation within the walls of the People's Palace. THE PEOPLE'S PALACE. A BIG TEMPERANCE HOTEL. The Salvation Army recently purchased the Natatorium, which it had been occupying as a hotel and shelter, and has converted it under the direction of … Captain Bishop, into a handsome Temperance Hotel. Our photographs will give a better idea than columns of descript ions of what the place looks like. It has been rearranged, innovated, repainted and repapered, from the spacious roof promenade, which overlooks much of the city, to the basement. Its situation in Pitt –street, a short distance from the railway station, makes it very convenient for country people, and they have already begun to patronise it in large numbers. Of course, no intoxicants are sold, but all sons of temperance drinks may be obtained, and there is an excellent cuisine. Each room is individually furnished, and there is an abundance of spacious and cosy single and double rooms, examples of which we illustrate. There are smoking' and writing rooms, sitting-rooms, a large dining-room, … plenty of family accommodation, and the general appurtenances of a good hotel, the whole being looked after by a large special staff. Outside fire-escapes have been arranged, and every effort ban been made to cater for the safety and comfort of guests. The whole building is lit, by electricity. Many people do not care to go to hotels for various reasons and hitherto the majority of temperance hotels have failed to hold their clientele largely because the standard of management was not kept up. People used to good hotels are not, satisfied with anything less than the comfort which they provide. The Salvation Army has had such varied experience that nothing in the way of management comes amiss to it, and it has been the success so far achieved with the People's Palace that has led to the expansion of its sphere to cater for a wider public. The 'sheller' aspect of the People's Palace has been retained on the northern side, entirely separated from the rest of the hotel, the inmates of which would find it difficult to realise that it was still carried on, and that the one kitchen staff serves both sides. When this building was originally erected, the idea was to have swimming baths right in the centre of the city, and hold aquatic galas in the hotel itself. It is in what were formerly the large swimming baths that the Army has the cheaper side of the hotel, where for from 3d to 9d a man can secure a clean and comfortable bed. The 'three penny' beds are in tiers like the third-class accommodation of a ship, and around are 'cubicles ' and single beds at higher prices. Like the rest of the house, this place is kept as clean as constant scouring and the free use of antiseptics can make it, and it, too, serves a very useful purpose, and is availed of to its fullest capacity. Even where hundreds of berths are arranged, tier upon tier, in the baths for the patrons, human nature and the home-loving instinct in man become apparent in the determination of the patrons Lo regard whichever bed they occupy as their special property and to insist, upon getting it regularly. The 'three pennies' include all sorts of men, men who have occupied important positions and are down on their luck,' working men, young and old men, who desire to eke out their scanty resources as long as possible, while they adventure in search of fortune. And many of them are as full of hope and ambition as the more fortunate folk who are able to pay for a luxurious room in the main building. The Palace Emporium Swimming Club's Annual Carnival. The third annual carnival of the Palace Emporium Swimming Club,-, which took place in Sydney Natatorium on January 31, was an extremely interesting display, and was notable for, among other things, the fact that P. C. V. Lane put up an Australasian record for the 300yd race, which he covered in 3min 51 4-5sec. Tyers holds the world's amateur record, which is 3min 48 2-5sec;and Nuttall the professional, 3min 50sec. There was an attendance numbering: about 1000, and great interest was displayed in the different events. During the evening Mr. A. Wylie, of Bronte Baths, gave an exhibition of diving, remaining underwater for 1min 22sec, and traversing 66yd 2ft.Messrs, A. Welsh and W. Shirt gave an exhibition of flying dives and somersaults. Mr. Samuel Hordern, Patron of the Palace Emporium Swimming Club. Palace Emporium Derby.-J. Pritchard, onMirella, 1; S. Hordern) jun., on Aurum, 2; H. Hopkinson, on Gauliis, 3. 100 Yards Interclub Handicap (semi-finals).First heat: J. Hindmarsh (Rockdale), 29sec, 1;W. Smith (Waverley), 20sec, 2; A. Wilkins (Enterprise), 17sec, 3. Time, .lmin 21sec. Secondheat: C. Bristowe (Eastern Suburbs), 24sec, 1; T.A. Johnson (Enterprise), 17sec, 2; C. Corbett (Rockdale), 36sec, 3. Time, 1min 17sec. Third heat: T. Bell (Rockdale), 34sec, 1; P. Russell(Rockdale), 39sec, 2; J. Stevens (Parramatta),24sec, 3. Time, lmin 21sec. Final: Bell. 1;Hindmarsh, 2; Smith, 3. Won easily. Time, lmin 25sec. The aquatic tug-of-war between the Palace Emporium S.C. and the Randwick and Coogee S.C. resulted in each team winning one tug, and a division was agreed to. The President's Cup, distance 300 wards. English amateur record, 3min 48 2-5sec, J. H. Tyers,Manchester, July 16, 1896;. world's professional record, 3min 50sec, J. Nuttall.-F. C. V. Lane(East Sydney), 1; Syd. Cavill (Palace Emporium) 2;R. Craig (Balmain), . 3. Only three started. Cavill and Lane kept well together for eight laps,though it was noticable that Lane always gained in turning. At the last lap he had a good lead,and won amidst enthusiastic applause by about six yards. Time, 3min 51 4-5sec. Obstacle Race, 66 yards.-First heat: J. Pritchard, 1; L. Kimmins, 2. Second heat: C. Swift,1; C. Martel, 2. The time for each heat was lmin 471/4sec, and the winners divided. Ladies' Championship of New South Wales,100 yards.-Miss J. Gibson, of the Sydney Club, was the only starter, and traversed the distance in lmin 51sec. Water Polo Match.-This was a match between two teams from the Balmain Club, and that captained by J. Taylor won by 3 goals to nil. The Balaclava Mêlée produced a spirited contest, in which the British chargers, mounted by S. Hordern's troopers, completely vanquished the Russians, under the command of J. Pritchard. The combat was carried out with vigor, and was provocative of great mirth. A Champion Australian Swimmer. MR GEORGE ALFRED MEADHAM. Mr. Urquhart, we believe, was one of the first to establish in England an Imitation of the Turkish bath, and the process was there improved upon by that gentleman, and by Dr. Barter and Dr. Brereton. Several baths on this principle are now being built m various towns in Great Britain and Ireland. Dr. Brereton having come to Sydney, has established one in this city, having taken and adapted to the purpose, the premises formerly known as the Captain Cook Hotel, in Spring street, at the rear of the Exchange. Having been invited by the proprietor to test the virtues, as well as the imaginary horrors of this bath, and having, in the pursuit of Knowledge subjected our fleshly tabernacle to the ordeal, we propose to confide to our readers our experiences there anent. The reader must not be deluded by the use of the word "bath" into the notion that the process is principally one of ablution. On the contrary, water plays quite a secondary part. It is essentially an air bath, nor is it even a vapour bath, special care being taken to keep the air dry, in which respect the modern style now introduced is considered to be a great improvement upon the ancient practice. The company invited, (for it must be understood that the operation is not, or at least need not be, solitary and unsocial.) having assembled at the bath shortly after seven o'clock in the evening, we were first ushered Into the dressing room, where the outer man, having been rapidly "easing of those troublesome disguises that we wear," and also a scarf substituted to wrap round the body, we were introduced forthwith into the warm room or " tepidarium," as it Is classically termed. This room, which is well ventilated, and kept supplied with a constant current of fresh hot air, supplied from the furnace in the lower regions of the building maintained at a temperature of about, one hundred and twenty degrees Fahrenheit. The first sensation on entering was decidedly not agreeable. There was a slightly oppressive and suffocating feeling experienced, which, how-ever, soon diminished, as the relief of a copious perspiration became established, and which, we were told, is seldom experienced after the first bath, and is mainly attributable to timidity. To increase this perspiration, and, indeed, afford material for it, cold water Is handed round, and imbibed freely. Presently the bath attendant came and poured a little cold water on the head. This was a most delicious operation, and seemed to relieve the heat of the room as if by magic, as the rapid evaporation instantly set up exerted a cooling influence. After remaining about a quarter of an how in the " tepidarium," we were ordered to advance into the adjoining room which is hotter still, and is styled the " calidarium." The temperature here was above one hundred and sixty degrees, and the floor was so hot that to tender skins neither sitting down nor even standing was perfectly comfortable. However, habit Is second nature, and we learnt to endure. More water imbibed here and a still more copious perspiration established. There was no mistake at all about it here, and, in fact, we found ourselves involuntarily making mental calculation as to how much of our precious body would be left If this laudation were to keep on long. However, after having been submitted to this disintegrating process for about a quarter of an hour, we returned to the tepidarium, where, being stretched out at full length on a deal table, we were deliberately shampooed by the bath attendant. The next process consists in being lathered, and then the body is submitted to the action of a shower-bath to clean everything off. In order to make the shower fall everywhere, an ingenious apparatus Is devised, which we cannot describe better than by saying It Is something like the body of a leaden skeleton, of which the back bone and ribs are pipes. The "rib" pipes breaking out from the back bone, do not, however, meet in front, an opening being left for the body to be introduced, but on the inner side they are punctured with small holes. When the water is turned on, therefore, there is not only the usual shower on the head, but innumerable little jets of water are squirted laterally against all parts of the body from these perforations in the ribs. The taps supply both hot and cold water, so that the«bower can be regulated to any degree of heat that may bethought desirable. There is also a little hand Instrument like the "rose" of a watering pot attached to a flexible hose, which can be used to direct a shower to any part of the body which may consider itself to have been neglected, or to stand in need of a little extra ablution. A large basin is also provided, to which taps for hot and cold water are attached, so that water of any temperature may, if desired, be splashed over any part of the body. The ordinary advice with regard to water bathing Is," dry yourself thoroughly, and dress quickly." Bat in the Turkish bath all this is reversed. Little importance is attached to the thoroughness of drying, and there is no friction with rough towels or flesh-brushes. But as a finale, the bather reclines for balf-an-honr or so in the " frigidarium," or cool room, which is maintained at the natural temperature of the air, and then dresses. There is no danger of catching cold in that exposing the body to the air, for the effect of the bath Is to steel the body against changes of temperature, while the exposure gives a fair chance to the blood of getting aerated through the pores or the skin at time when they are thoroughly open. This will be understood more clearly when the rationale of the bath is understood, for, of course, It has a rationale. Not that the design of the bath is a product of modern medical science. Quite the contrary ; it seems to have existed before hospitals, and diplomas, and schools of medicine were known. It is a product of ingenious common sense, or perhaps empirical accident. Its origin is lost in a remote antiquity. Many nations seem to have had it In some form, and traces of it have been reported to exist among the aborigines of Australia. But modern medical science, though it finds it, justifies it, and explains it. And the fundamental fact on which this justification Is based is that the skin is a breathing organ. The object of breathing is to oxygenate the blood, and get rid of the carbonic acid, and this, which is the process of combustion, is the cause of animal heat. The task of respiration, it is popularly supposed, is confided to the lungs. So it is chiefly, but not exclusively. The skin breathes also. The essence of breathing is the bringing of the blood in the minute vessels of the living membrane in contact with the air. The pumping process of inhaling and exhaling is merely a mechanical expedient for forcing the air into the lungs and out again that it may come into contact with the living membrane. This is not necessary with regard to the skin, provided the pores are open to admit the free contact of air. Some of the lower animals breathe exclusively through the skin; and, if covered with oil so as to exclude the air, die instantly. A human being, if varnished over and made outwardly air-tight, would also soon die, as the lungs would be unequal to the task of adequately aerating the blood. The modem practice of wearing tight-fitting clothes, and especially defective exercise, tend to dog the pores of the skin and prevent their free action. Hence more work Is thrown on the lungs than they can do, the skin, unable to breathe, is not Kept warm, and chill, colds, and congestion of the Internal organs ensues. The excretory organs of the system do not perform their work properly. The waste matter of the system is not carried away, it remains in the body, and nature, deprived of the natural outlet, tries to deposit the surplus particles somewhere. Hence tubercles, calculus, gout, "et boo genus omne." Hence the great recommendation of the Turkish bath is, that it is a most powerful agent for cleansing the skin and aerating the blood, and is curative In all diseases which have amen from neglect of this. But washing and bathing, and Motion of the skin, are all cleansing processes, It may be said-in what then lies the superior virtue of the Turkish bath? Simply in this that it does thoroughly what mere ablution only does partially. Washing cleans the surface of the skin, the bath purges the substance of it. The skin is perforated with innumerable little ducts, which convey away the matters carried off in perspiration. These ducts are so many little servers if they get blokced up, the body does not throw off its waste tissue properly. Washing only cleanses the orifices of these servers. A profuse perspiration flushes them right through. When cleansed in this way, and exposed to the air, the skin can breathe, and the act of breathing keeps it warm. The Russians, after taking the bath, often roll in the snow, sod without in any way suffering from cold. ABOUT eighteen months since, Dr. Brereton, a medical man who had recently arrived in the colony, and who had taken a conspicuous past in the establishment ofTurkish baths in England, determined on opening a similar institution in Sydney. For this purpose he rented a small building, formerly an inn, in Spring street, and by the construction of a heating, washing, and other apparatus, was enabled to administer Turkish baths, though the rooms were inconveniently small and otherwise ill-adapted for the purpose. The bath soon became well patronised, and the more so as patients after taking a few baths gave the most explicit testimony to the cures they had by the use of the bath experienced of long standing and disabling complaints. The bath at length obtained such popularity and extensive use that it was resolved to erect a new building, in which every appliance could be introduced requisite to carry out the system in the most efficient manner. That resolution has been very successfully carried out, and on Monday last the new Turkish bath was permanently open to the public. handsomely illuminated, and descending a few steps, the Frigidarium it entered. This apartment, which measures thirty-five feet by twenty-five, is to be used by visitors first for unrobing, and afterwards for cooling themselves when the bathing process is completed. The floor is paved with slabs of marble, and the windows consist of panes of blue glass frosted. At either end of the room are small curtained compartments furnished with pegs for suspending the clothes upon. 'A number of couches extend along the room, being so constructed as to allow the bather to recline in the most luxurious posture while cooling. The Frigidarium is separated by a thick brick partition from the heated rooms in order to prevent the assimilation of the atmosphere of the different portions of the building for which purpose there are also two doors. These doors open upon the Lavatorium. The principal apparatus in this apartment consists of a framework of lead pipes perforated at very short intervals, and forming imperfect rings, so arranged that while the bather stands within them the water is thrown with considerable force upon every part of his body. There are two of these shower baths, besides the other requisites for a complete ablution. To the left along the end of the building is the Tepidarium, the room into which the bather enters from the Frigidarium. The temperature maintained in the Tepidarium is about 120 degrees, sufficient to produce moderate and gradual perspiration, after which the bather passes onto the Calidarium or Sudatorium, where he is subjected to an average temperature of 170 degrees, remaining there until a profuse perspiration, assisted by drinking frequent glassfuls of cold water, is obtained. The two heated chambers are each twenty-seven feet in length, and are divided by a brick partition, the pas-sage between them being kept open ; both are plentifully furnished with seats. The floors of these rooms are also of marble and consequently so retain the heat as to be rather painful to the feet of those not inured to the sensation. Accordingly wooden slippers are provided for the bathers. As in the Frigidarium, the windows of the heated rooms are of blue glass. The gas-burners are enclosed within lanterns of stained glass, sending down a subdued and agreeable light. The shampoo-ing tables, upon which the bather reclines while the attendant rubs and kneads his body to remove superfluous particles from the skin, are of marble, and are placed in the Lavatotium. One great essential to comfort in the Turkish Bathis the maintenance of thorough ventilation in the heated rooms, and this is at the new Baths success-fully accomplished. The hot air enters at the furthest corner of the Sudatorium, and after passing through the Tepidarium finds vent in on aperture in the ceiling of the Lavatorium through which it rushes with great force. There are also two four-inch pipes - one in each of the heated rooms - which assist in promoting the ventilation, there being a constant current of hot air from the furnace to these apertures. This mode of ventilating the rooms was discovered and first applied by Dr. Brereton, and is a great improvement upon the plan previously adopted. The floor above is also fitted up with seats and couches for use as a Frigidarium ; being partially open at the sides, a constant and abundant draught is afforded. One great recommendation of the upper Frigidarium will be, that refreshments will be supplied, in the form of fruits, confectionery, ices, and temperate drinks, while those who patronise the weed will be able to enjoy a comfortable smoke. Many bathers who can afford the time will be induced to prolong their stay in the upper Frigidarium. The lower floor is devoted principally to apartments for the bath attendants. The furnace is, of course, immediately underneath the Calidarium, and in addition to the stream of hot air introduced through a pipe into the room, the floor is heated by a series of flues running immediately underneath it. There is also on the lower floor, adjoining the furnace, a small chamber, in which a private bath may be taken by persons who do not wish to bathe in company. In addition to the Turkish bath, a room is fitted up on the lower floor for supplying either a sitz, a plunge, or a shower bath. These will be available for those who may be sceptical as to the advantages of hot air bathing, and the pleasurable and invigorating processes will no doubt be frequently indulged in. The Turkish Bath has been erected by a small company, established about a twelve month since. The cost of the building is about £5000. It is calculated that a hundred persons will be able to bathe at onetime. The charge made for the baths is at the rate of six for a pound. The building has been carried out under the immediate supervision of Dr. Brereton, from designs prepared by Messrs, Weaver and Kemp, architects. The principal portion of the work has been contracted for by Mr. Lavers, of Newtown. The opening of the bath was on Thursday, the 14th instant, inaugurated by a sumptuous dinner, in the upper Frigidarium. The repast included almost every delicacy that could be desired; but as it is not in accordance with the hydro-pathic treatment to indulge in wines and salt liquors, it was deemed desirable to dispense with fermented drinks on the occasion ; their absence was supplied by ices and iced syrups, in great variety. About a hundred and twenty ladies and gentlemen accepted invitations, sent by the directors of the company - the number comfortably filling the seats provided. The guests comprised several of our more wealthy and influential citizens. Sydney's First Natatorium - by A J Guesdon, 2015.